The sentiment behind that, in this age of Yelp, might explain Sushi Freak, the new Downtown create-your-own-sushi-roll spot. It is, after all, hard to criticize the chef’s artistry in putting together sushi rolls when you made the choices yourself. The create-your-own-roll process is not unlike the protocol at Subway: Pick your wrapper (seaweed or soy sheet) and protein (choices range from raw fish such as tuna, yellowtail and salmon to cooked proteins such as shrimp, krab mix, freshwater eel and fried calamari) and add fillings (such as avocado, cucumber, daikon sprouts, green onion, mandarin oranges, mango, etc. ), “toppings” (avocado, flying fish roe, tempura crunch, etc.) and sauces. The assembly line ends at the cash register. The program at Sushi Freak (1071 Sixth Ave. with another location in Linda Vista) can result in excellent rolls. 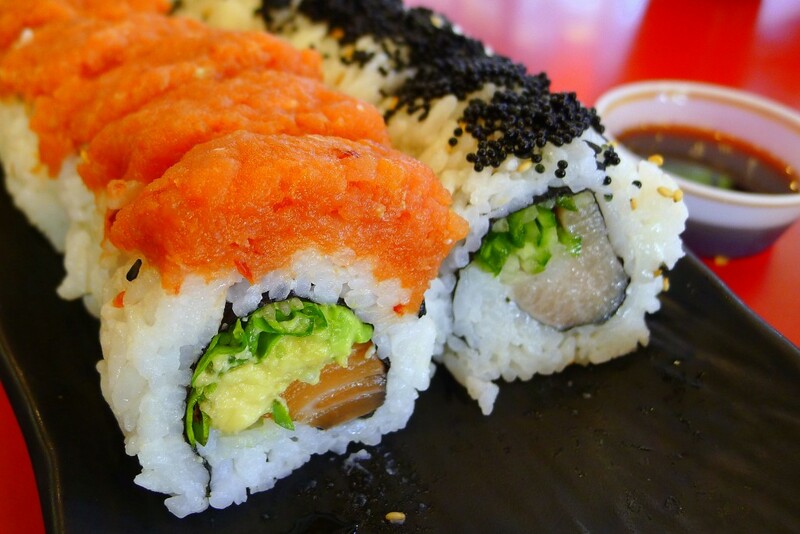 My salmon roll in nori with avocado and green onion and a spicy-tuna topping was superb. So was my yellowtail roll in nori with cucumber and daikon sprouts and masago. The quality of the seafood on two trips was very good, though on another it was distinctly less than excellent (but certainly not unhealthful). Each step along the Sushi Freak assembly line—from wrapper to protein to toppings (but not fillings or sauces)—adds to the cost. By the end, a roll is roughly the same price one might expect at a standard sushi restaurant. The main differences are the quality of the rolling itself (which varied widely from perfect to falling apart) and the girth of the rolls (from large to massive). If you get a well-rolled, particularly big one, you certainly get bang for your buck. But why? It’s a question that clearly should be asked about the “Sushi Burritos”—essentially sushi rolls on steroids. These are massive, engorged missiles of rice with proteins and fillings inside in ratios that make notions of flavor-balance aspirational at best. One of Sushi Freaks’ normal rolls is a meal, and two is over the top, but the Sushi Burrito will likely spoil tomorrow’s supper. And then there’s Sushi Freak’s other inherent danger: the wide variety of options. Green chile, mango and coconut shrimp topped with unagi, anyone? Teriyaki chicken with cream cheese and jalapeño and spicy tuna? Perhaps add a free sauce like wasabi mayo? There’s more to making sushi rolls than picking one from Column A, one from Column B and two from Column C. There’s artistry. There’s craft. There’s sourcing quality ingredients. There’s technique (knife and mat). Just because everyone’s a critic doesn’t mean everyone’s a sushi chef. At Sushi Freak, you’ll pretty much have only yourself—and a fast-food concept—to blame for the result.